Israeli soldiers shot, on Monday at dawn, a Palestinian man in his own home, and abducted his son, in Halhoul town, north of Hebron, in the southern part of the occupied West Bank. The army also abducted four other Palestinians in Hebron and Ramallah. Media sources in Hebron said the soldiers invaded the home of Khaled Shehda ad-Douda, 50, before searching and ransacking the property and abducted his son, Mohannad. They added that the soldiers fired live rounds in the home, moderately wounding Khaled’s father in his left leg, before he was rushed to the Hebron governmental hospital. In addition, the soldiers invaded and searched several homes in Beit Ummar and Beit Kahil towns, near Hebron, and abducted Abdul-Majid Ali ‘Aadi, 30, and Talha Mohammad Zohoor. 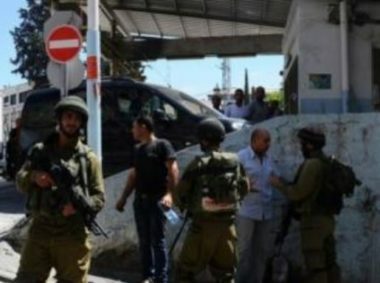 The soldiers also installed roadblocks at Hebron’s northern entrances, in addition to Sa’ir and Halhoul town, before stopping and searching dozens of cars, and interrogated many Palestinians while inspecting their ID cards. In related news, the soldiers invaded Kafr Ni’ma village, west of the central West Bank city of Ramallah, and Silwad town, east of the city, searched several homes and abducted Ahmad Hasan Nasr and Ahmad Mousa Hamed.